Searching for seaweed on the shores of Ireland. There are as many as 10,000 known seaweed varieties growing in oceans worldwide. Six hundred of those live along Ireland’s 3,000-mile-long coast. On the Dingle Peninsula in County Kerry, Darach Murchú keeps track of his local species using notes that are hand written in minuscule print on water-proofed paper. He understands something that many land-dwellers don’t: Among pools left behind by the receding tide exists a magnificent world of edible plants. “Some resemble trees, others resemble miniature plants, and others look like grasses” Murchú says. “They have all sorts of different forms — spirals, snake-like, sausage-shaped, tuber-shaped. Some are microscopic; others much deeper are massive, growing 150-feet tall.” He knows this world more intimately than most, and he wants the people who aren’t as well acquainted with oceans to know it, too. 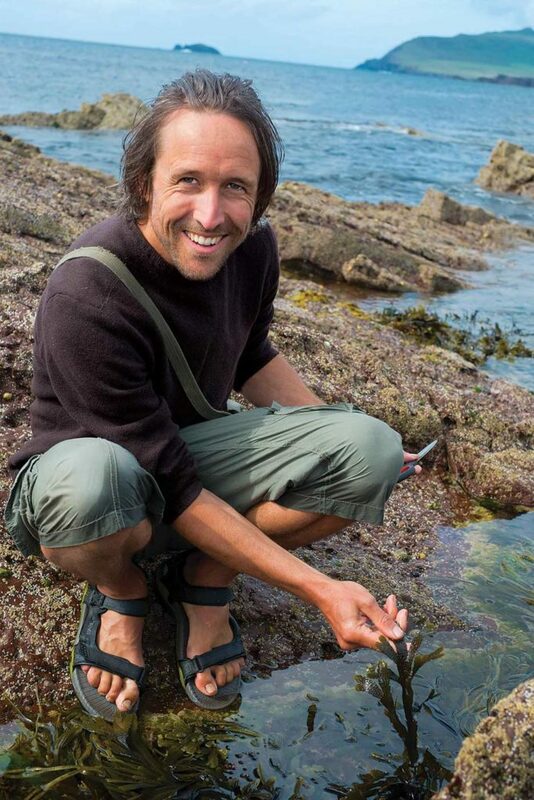 Ó Murchú is reaching out by teaching about seaweeds in classes offered through his business, Elements Outdoor Training, and as part of seaweed foraging and cooking classes at the Dingle Cookery School. Spending a few hours on the seashore with students, he explains how to identify, find, and harvest up to 10 different kinds of seaweed. 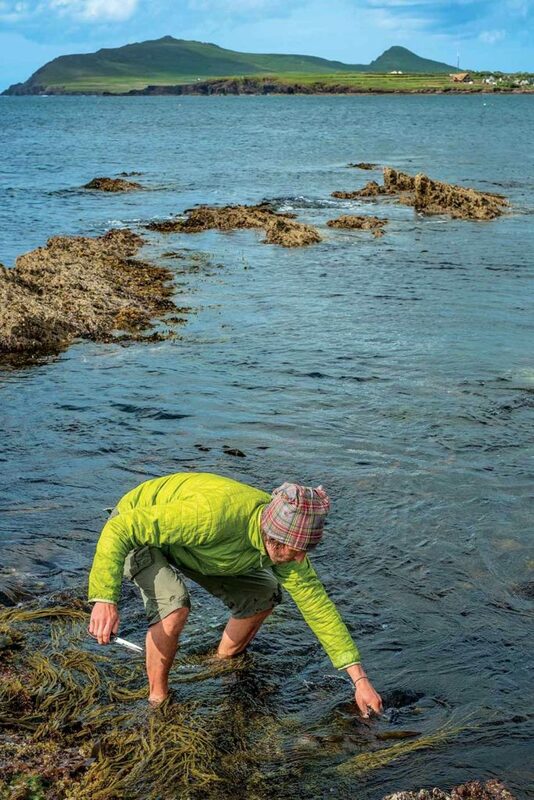 The group then travels a few miles away to Dingle, the peninsula’s main harbor town, where they learn from Murchú and Chef Mark Murphy how to use the seaweed they’ve collected to enhance their food. The course fits well into the Dingle Cookery School curriculum, which showcases fresh-caught seafood and traditional Irish cuisine. Ó Murchú shows students how to identify and harvest edible plants. The group then travels a few miles to the Dingle Cookery School to learn how to use them in food. it’s also good to eat. loving the salty, chewy chunks of oarweed as a child. His way of looking at things comes from the unusual life he’s led life so far. He studied engineering at the Dublin Institute of Technology and then worked in Silicon Valley. He studied to be a mountain guide in Scotland, and led expeditions to the Himalaya and other high places. He’s always returned to the Dingle Peninsula where he spent time as a child. Now, in between other stints, he teaches people that the sea plants they’ve thought to be stinky and ugly — are actually worth a taste. The foraging workshop begins with a simple lesson: There are three classifications of seaweed — brown, red, and green. Even this little spot, the size of a small back yard, is diverse. 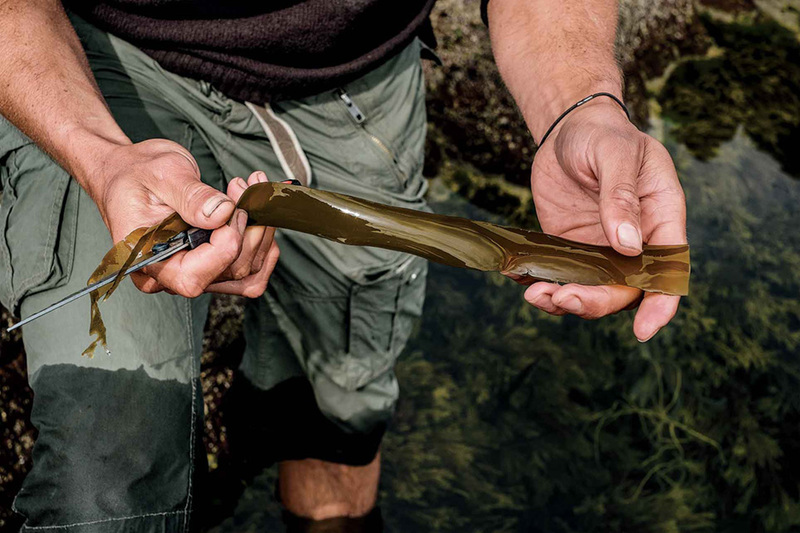 There are groups of bladder wrack, oarweed, and dillisk – “powerhouses against cancer,” he says. And there are patches of carrageen and tangles of sea spaghetti. As students peer ever more closely, the discussion meanders, and soon the course is about much more than plants. Generations ago, Irish farmers were building new soil and enriching existing soil by folding in strands of seaweed they hauled from the shore zones. In certain parts of the island’s west coast, the technique is still in use. Murchú worries that the rocketing world demand will cause careless harvesting and will damage marine ecosystems. He hopes to raise awareness in the class. He gently pushes his thumb at a thimble-sized anemone to show how it forces a mild suction against the skin. He points to cone-shaped limpets that look like volcanoes. “That’s their patch for the rest of its lives,” he explains. Their calcium shells are developed to connect with the rock contours where they were formed. “Once the tide comes in, they’ll be eating small seaweeds on the rock or elsewhere. They have a tiny foot, and they’ll leave this spot and wander around.” The limpets wouldn’t be able to get the same seal against a rock if they were to settle in another location. “Once they sense the tide is going out, they come back to the same place,” he says. When he’s foraging, Murchú, too, watches the rise of the sea. Absorbed in the work of inspecting this freshly revealed ocean world, he can be surprised to find that so much time has passed, and the tide is returning. Training the South's most famous flock for their walk of fame.